This recommendation comes with a bit of a caveat. TeamViewer makes remote access to your computers easy. If you have TeamViewer set up on your machine at home, you can connect to it from just about anywhere you have an internet connection and via just about any device that you might have with you. It's very cool and relatively simple to set up. It's also fairly expensive if you're looking at a solution for your business. 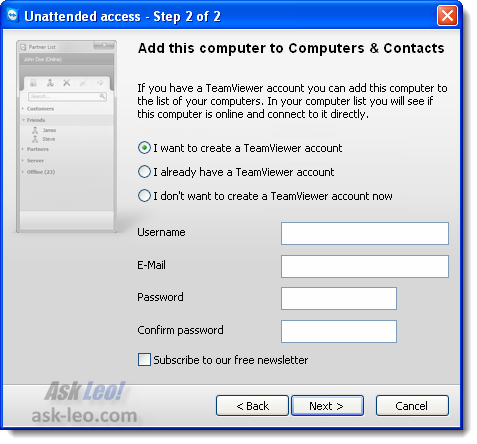 However, TeamViewer is free for private use, which makes it an ideal solution for individuals just wanting to remote-access their computer back home or any other non-commercial uses. The best way to think of TeamViewer is as Remote Desktop on steroids, working transparently across the internet, not requiring any complex port-forwarding or router configuration. 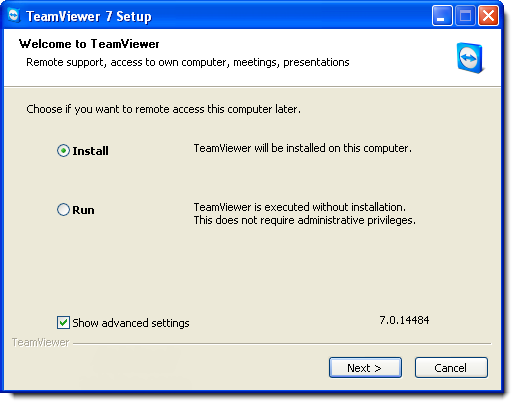 In order to use TeamViewer for remote access to a computer, it must be installed on that computer. In fact, the easiest way to use TeamViewer is to install it on all of the computers that you might want to connect to or from, and have them all associated with a single TeamViewer account. The dialog describes it well, but the difference really boils down to this: if you indicate that yes, you want to be able to remote access this machine, it really means that you want to remote access this machine without needing to be present. In this case, TeamViewer is installed and runs automatically when Windows boots. You'll be able to initiate connections to this machine at anytime without needing to start TeamViewer on it manually. For security, you can also ensure that any remote access requested needs to be approved by someone at the machine. Unfortunately, that requires that someone be at the machine. 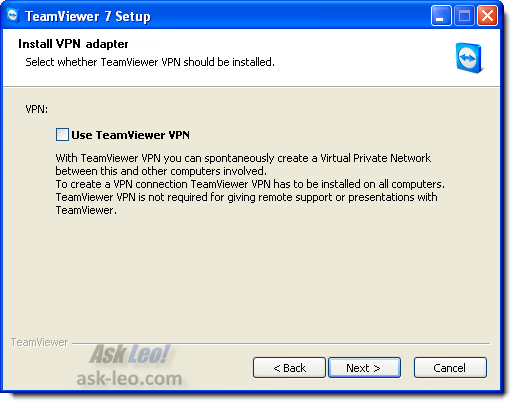 The TeamViewer VPN is optional. I don't use it myself; I'll describe what I do instead later. If enabled, this would allow you to copy files and connect to remote machines as if they were on your local network. The default install location should be fine, as should the Start Menu folder. TeamViewer is then installed and run. After setup is complete, TeamViewer will run and begin the configuration wizard to set up unattended access. All of the machines that you associate with your account will be easily accessible from each other. 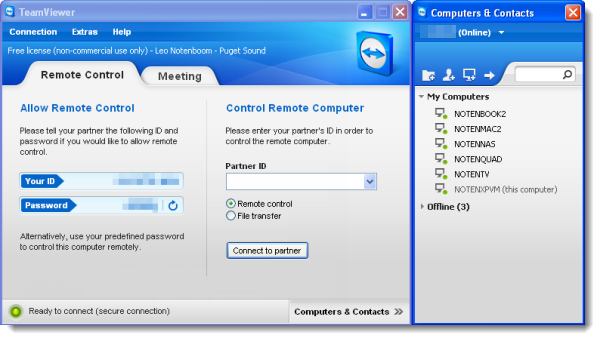 Once configuration is complete, TeamViewer shows you its main UI and the list of computers associated with your account. If the setup seemed perhaps longer than you'd like, this part should make up for it. To connect to a remote machine, double-click on that machine's name in the list. That's all. In this example, I double-clicked on "NOTENMAC2", my MacBook Pro. 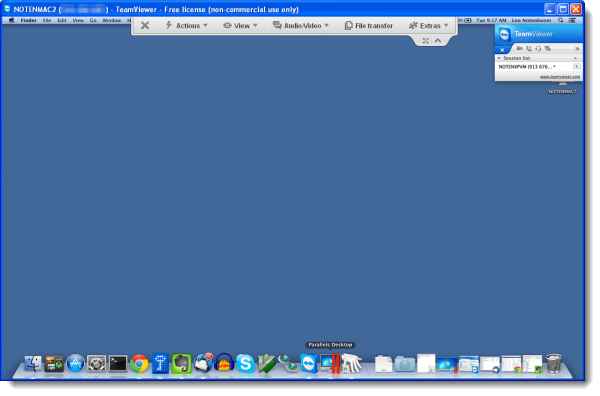 TeamViewer (installed in Windows XP here) created a remote connection to my Mac and initiated a remote desktop sesssion. I can now use my Mac almost as if I were sitting in front of it. Unlike traditional Remote Desktop, if there is someone actually at the computer, they can also interact and see what's happening. A double-click was all it took. As you can see from my list, I have TeamViewer installed on several of my personal machines, including my wife's. That means that I can connect to any of them from any of them, regardless of where I happen to be. That is what makes TeamViewer such a great solution for home users. I also have TeamViewer installed on my Andoid tablet, on my Kindle Fire, and on my Android smartphone. No, I can't remote control those devices, but what I can do is connect to any of my computers from those devices. I've connected to my desktop machine from my phone to get a file while out in the middle of nowhere (well, a "nowhere" that still had cellular coverage ). I've connected to my desktop machine from my Kindle Fire while I was sitting in Starbucks because I needed to check the status of some information there on. Yes, it can be a little clunky to drive a desktop PC that assumes a mouse and keyboard from a touch-screen device that has neither, but it's possible. Sometimes, "possible" can be a very convenient thing. I mentioned above that I don't bother to setup the VPN. Nothing against the VPN, but I use something else that works in all the situations I happen to be in. I have Dropbox installed on all my devices - computers, tablets, and phone. If I need a file that's on a remote computer, I use TeamViewer to connect to that computer, then on that computer, I copy the desired file to a folder in Dropbox. A few minutes later, the file that I wanted appears in DropBox on the device that I have and I'm good to go. It really is a full-featured remote access product. And while they have (in my opinion) priced the commercial version out of the reach of small business, the fact that they've made it available free for personal use makes TeamViewer a very useful tool for the average individual. You can see the pricing for the commercial version, as well as a feature comparison for some of the available purchase levels here. You can download TeamViewer, free for personal use, directly from their homepage. TeamViewer. Free for personal use, I recommend it. I'm all about full disclosure: normally when I recommend a product I take time to point out that the article may have links to products for which I might get some form of compensation should you sign up, buy or otherwise get the product. Turns out, that's not the case here. To the best of my knowledge there are no such opportunities relating to this product. The availability of this compensation - typically known as an affiliate relationship - does not affect what I recommend. I choose what I use and recommend first, and sometime thereafter see if there's an affiliate relationship available - often there is not - as in this case - but my recommendations stand. You can read more about this in my article Product Reviews, Recommendations and Affiliate Links Disclosure. While you're at it it's worth reading Why you should never blindly trust an online recommendation (even mine) as well. What is Remote Desktop? Remote Desktop allows you to use your Windows machine remotely, almost as if sitting in front of it. Coupled with a VPN solution, it's very powerful. Can I use my IP address to connect to my computer without remote desktop? Remote Desktop is configured to keep your home computer secure while you connect to it from a remote machine. Doing this correctly requires the right software and permissions. What is a VPN? A VPN or Virtual Private Network is a way to security connect with machines elsewhere or to securely connect to the internet from an unsecure location. In the past, you have recommended Hamachi and LogMein to perform similar functions. 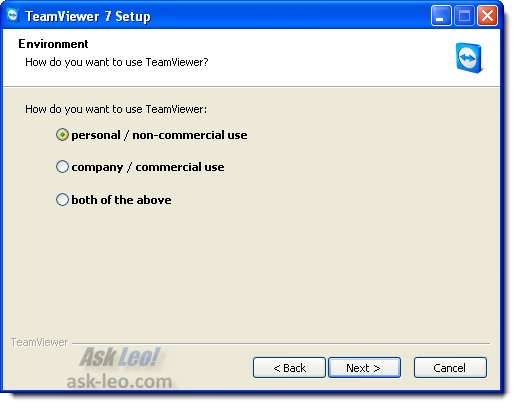 Is Teamviewer a better option? I've never directly recommended LogMeIn (never used it, though I understand it's a fine program). Hamachi is only a VPN, not remote access, but it allowd Windows own Remote Desktop client to work across machines connected to that VPN. Since LogMeIn purchased Hamachi some years ago it seems to have languished and seems quite well hidden at times as LogMeIn attempts to direct people to their paid products. Overall TeamViewer seems simpler to set up, easy to find (everywhere) and free for personal use. TeamViewer may be expensive for an Enterprise on first perusal, but as IT for a small Medical Center who ends up supporting PC's in areas that do not belong to us (Employees trying to work from home, doctor's practices who connect remotely, etc.) as well as people like home transcriptionists, TeamViewer has been well worth the money. It saves us time and money by not having to travel to places that are sometimes over 50 miles away. It has greatly enhanced our ability to take care of an exponentially greater number of users on a much more timely basis, and has been an invaluable tool. I would recommend it to anyone who can even remotely afford it, as I feel it is a good investment. Yup! I've been using TeamViewer for several years and it's the best thing since the invention of "Ask Leo" and sliced bread. Get it! My niece just away to college, and my heretofore "perfect" VNC setup vis-a-vis her Mom's home router (using DD-WRT, port forwarding, and RealVNC on the home machines) is now kaput for her college dorm. So, I setup and used TeamViewer a mere 5 days ago, just before this article. I was very impressed. It worked stunningly well, and it was dead simple. A wonderful experience. I spent more time reading about it than actually installing it and logging in to my niece's laptop to solve her printer problem. It was easy to tell her what to download, we installed it together on the phone, and literally 3 minutes after her install was done, I had logged in and fixed her problem. 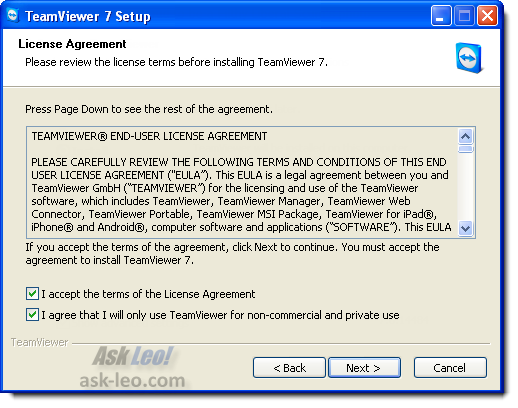 In doing my research, I remember being slightly annoyed by TeamViewer's use of the vague & generic term "partner" when they should be using more specific terms like "local" and "remote" computer. Otherwise, I would say this is the kind of software that is simpler to install and just use it than it is to read every detail in the manual. You didn't comment on TeamViewer's security. 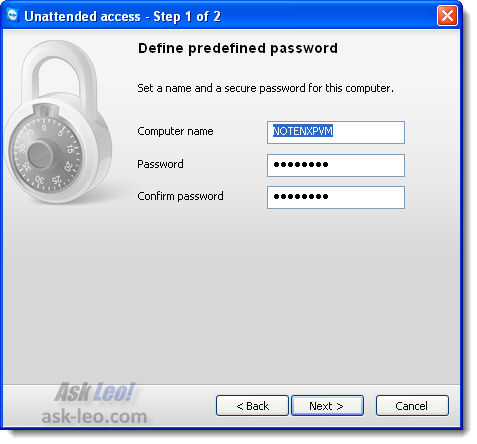 The program allows ANY computer to access the files on your computer provided you know the password. I would have some angst about this because of the apparent ability of talented hackers to figure out or get around the password, even though it's very cryptic. Am I being paranoid? I'm not doubting TeamViewer is secure. I've been using it for years. However, I've always wondered about one thing. When using it just "one-on-one" for remote control or file transfers (meaning just two computers are connecting), does TeamViewer securely connect the two systems directly, or is a "third party" server negotiating and handling the connection? I'm just curious. In any case, I'd strongly recommend TeamViewer to anyone who ever wished they could help someone at a remote location, or send/receive files with them. I can't tell you how many times my wife has been elsewhere asking for computer help. I've always been able to come to her rescue thanks to TeamViewer. While I haven't verified it, after the initial connection creation, which would involve a third party server to locate the remote machine, the performance leads me to believe that the connection is point-to-point. 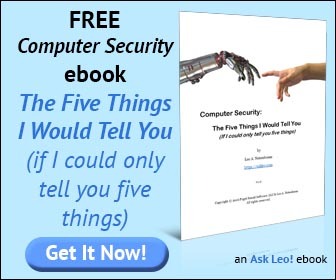 I'm very suspicious of this type of software, and, in fact, have personally experienced an unauthorized user connecting to my computer by way of remote desktop. While the annoyance was benign, it is nevertheless a bit disconcerting. Suppose the connection weren't friendly and someone intentionally did damage to my computer? Or, perhaps the benign connection was not adequately secured and allowed other less friendly connections to be made? Or what if the benign connection came from a computer that was infected with malware? It all seems very risky to me. Then only run the software when you need it, don't leave it installed or running all the time. Yes, that means you may need to have a person at the remote computer to run the utility. I certainly prefer Teamviewer to the other two mentioned. As well as the expected uses, I have found it useful to effectively enlarge the 9 inch screen of my Acer Netbook, up to the 19 inches of my main HP Pavilion PC Screen, simultaneously allowing me to use the HP's full-size keyboard and mouse. Very good article, Leo. I agree with you about the high cost for a small business (which accurately describes me, a sole proprietor computer tech with zero employees). I would like to use Team Viewer, but at an affordable price. Can you recommend any other programs for remote support that would be affordable? 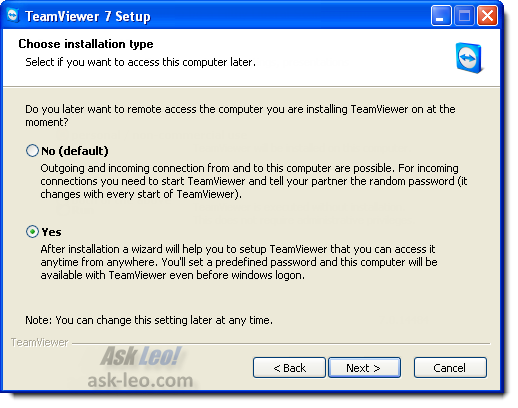 TeamViewer also has a "QuickSupport" executable that allows you to connect to a remote computer without having to install the software on the remote computer. You can email the remote person the executable or the link to the website. The remote person simply runs the small executible and gives you the password info and you can then connect with your local machine. There are alternatives to TeamViewer such as GotoMyPC and LogMeIn but those have high monthly fees. 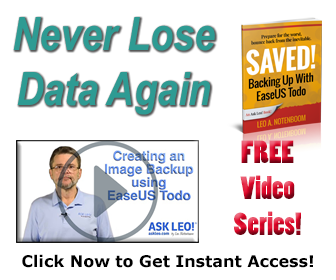 $750 might be a bit steep but it is lifetime license with no recurring monthly fees. The TeamView Security Statement, available on their web site, is a very good place to start as it clearly explains how the system works. "... our routing servers will not be able to read the data stream". It does not say that their employees have no access to what their customers are doing. Both LogMeIn and GoToMyPC clearly say that their employees can't spy on their customers. LogMeIn is married to a web browser, so I think both GoToMyPC and TeamViewer are better options. I agree and as I purchased for commercial use while it is expensive it has really paid for itself in no time. I can't speak for others in other countries but in Australia we can claim it as a business expence and include it in our tax return. Teamviewer is excellent for non commercial use as it's easy to setup and use. But if your in IT for a living it's well worth the cost and it's only a one off payment for a single account on a single PC but you can have multiple clients. I use it for one off quick access support and for server monitoring and server remote access. I presume the remote computer must be running? i.e. you can't start it up using team viewer. The remote computer has to be up and running and TeamViewer has to be running as well. I think that teamviwer may actuly be cheaper than other such remote programs because with others that can do what TV can do you usually pay per computer every month. TV is a one time purchase and you can access as many computers as you want and its yours for life. You can also use it to do team meetings with video, kind of like skype but multiple videos and presentation abilities. One important detail that TV has also is that you can send an email to somone that needs your help and the person receiving that email clicks on a link which downloads and runs TV but does not install it. This person gives you an id number and password that TV generates on there computer and you enter there id and password into TV on your computer to access their computer. When your done this persons computer is not part of your acount. The distinction here is i may have computers i want to access because they are my computers and i want to remote to them and i have TV installed on them running in the background, but i can also help somone on the spot and be done and that computer is not on my account nor do they have an account, and TV will not be running on there computer. Safe for them, safe for me. i can access any computer in the world with the permission of the operator of that computer with all the great things TV can do, including printing, file sharing, sound, and when were done were done. Also some other programs like TV when you link a computer up with an account thats the only account that can access that computer. With TV i could have a corporate account and access a certain computer and access that same computer with my personal account. Or a team that has to access the same comuter. Thanks a lot Leo. I adore solutions with brains, and this is one of it. Easy to setup, easy to use and with no hick-ups. teamviewer is working well on my laptop and desktop. When I started to download it for my Kindle Fire, I didn't know which option to choose. Same for my iPhone. Thanks for your help. Teamviewer is great. Have been using it for my own computers and remote family and friends for a long time. I find vpn or dropbox unneccesary because you can drag and drop from one conputer to another or use the available file transfer in the main menu bar. Another option for commercial use is Radmin. If you only have a small number of computers that need to run the server software, then this option will be much cheaper than TeamViewer. With Radmin, you can run an unlimited number of viewers. Only the server software needs a paid license. However, for personal use, TeamViewer is better because Radmin does not have a "free for personal use" option. The first Ammyy Admin v3 is much easier as It works behind gateways NAT without port mapping and doesn't require installation, registration and specific settings adjustments. Literally you can connect to any PC within 20 seconds. Good alternative though! Hope you'll like it! I'm a thoroughly-convinced TeamViewer user. Been using it for about a year now between 2 laptops, my work PC, 4 PCs at home, and a PC at church. I can't even begin to tell you how much time & frustration TeamViewer has saved me. Stable, flexible, cross-platform, and less clunky to use on a mobile device than many remote control applications. And by the way, you CAN control some Android phones with TeamViewer! Right now it's just Samsung phones, but I'm thinking they'll expand that over time. I've installed it and tried it myself and it's easy, free, and effective (when actually needed). Just search Google Play for "TeamViewer QuickSupport"